Introduced in December 2003 at the MILIPOL 2003 show in Paris, France, this is the last update in the more than 30-years-old firearms cache which served, and still serves, honourably police forces and military around the world. http://www.isayeret.com/weapons/smg/uzi/parauzi.htm This link leads to a page of the Israeli Special Forces which talks about the "Para-MicroUZI", in fact a modified Micro-UZI for Special Units such as the SHAYERET-13 and the YAMAM (SWAT team of the Israeli National Police), which needed a more effective sidearm, and for those units, such as the Combat-SAR Teams, which need a Personal Defence Weapon to held when ropeling, etc. 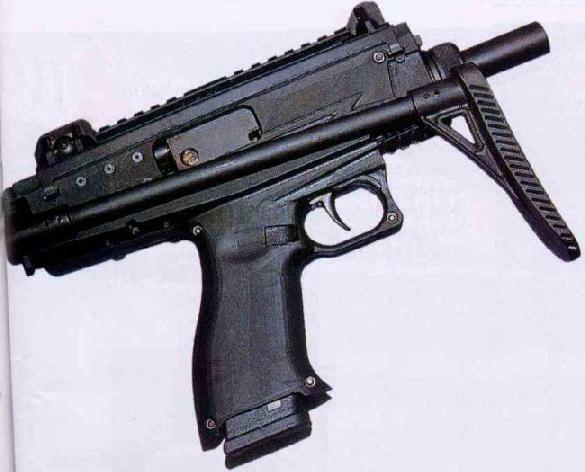 The "original" Para-MicroUZI was just a modified Micro-UZI with side-cocking, and Picatinny rails over the frame and under the barrel; it is already by itself a HUGE update in the UZI Weapons System, to which adapting optionals has always been so difficult that the attachment of ANY kind of optional to such a weapon has been considered a rarity, with a very little cache of sights, laser, tactical lights, etc. adaptable to be attached to those guns. Now, with the rails, there's no limit to the possibilities. AS happened with the TAVOR-2, born after the evaluation of the TAVOR Weapons System by the Israeli Special Forces, so the UZI-PRO is born after the IMI engineers have gathered reports, impressions and complaints of the users about the Para-MicroUZI; as a result, the UZI-PRO is still a prototype, but it will soon be distributed between the Israeli Special Forces' personnel for evaluation, and commercial launch is expected in the first months of 2005; it's gonna be the ultimate version of the Micro-UZI, replacing the standard Micro-UZI and the current "Para-MicroUZI" in service, and ultimately replacing them in the production lines; a semiautomatic-only civilian version, with no side-folding stock, is expected too. The UZI-PRO reduces the weight of the standard Micro-UZI and Para-MicroUZI, being it made of polymers and lightweight titanium alloy. It fires from the closed bolt and features a side-cocking lever, with rails over and under the frame for a wide array of optionals to be attached on; the barrel can readily accept a snap-on suppressor. Furthermore, since the first end users of the UZI-PRO will be Israeli SHAYERET-13 and YAMAM units, which in the past have adopted the Glock 17 and Glock 18 pistols as sidearms, the UZI-PRO will feed from Glock 17-rounder and 33-rounder magazines; according to rumors, license will be given to IMI to manufacture the GLOCK patent 17-rounds and 33-rounds magazines for the UZI-PRO.